In 2017 we started VMF’s Indigenous Youth Mural Arts Program with the intention to provide a platform for Coast Salish people and Indigenous people living in Vancouver to tell their stories. In addition to the murals that have been created by our artists, we have also been fortunate to work alongside talented Indigenous facilitators and dozens of keen youth to produce many artworks for display at festivals around the city. Our approach in developing these programs has been to connect with indigenous-run organizations, learn what their processes and goals are, and then to add capacity to their existing arts and culture programs with our workshops. In the first year of our youth program led by Jeska Slater we featured two workshops: “Cultural Reclamation Through Graffiti” and a "Hides Painting" program which supported youth to choose their own designs, scale them onto canvas “hides” and prep them for proud display at summer festivals around town. We’re grateful for the artist mentorship that the program received in it’s inaugural year -- thanks to Paul Windsor, Jenny Ritter and Khelsilem! 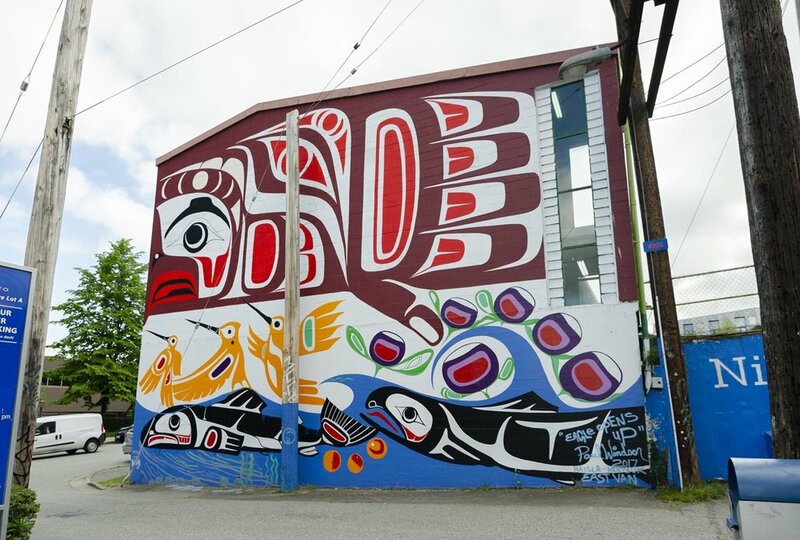 Moving forward, we are eager to continue to address how murals and public art can play a meaningful role in the ongoing reconciliation process with local First Nations communities. 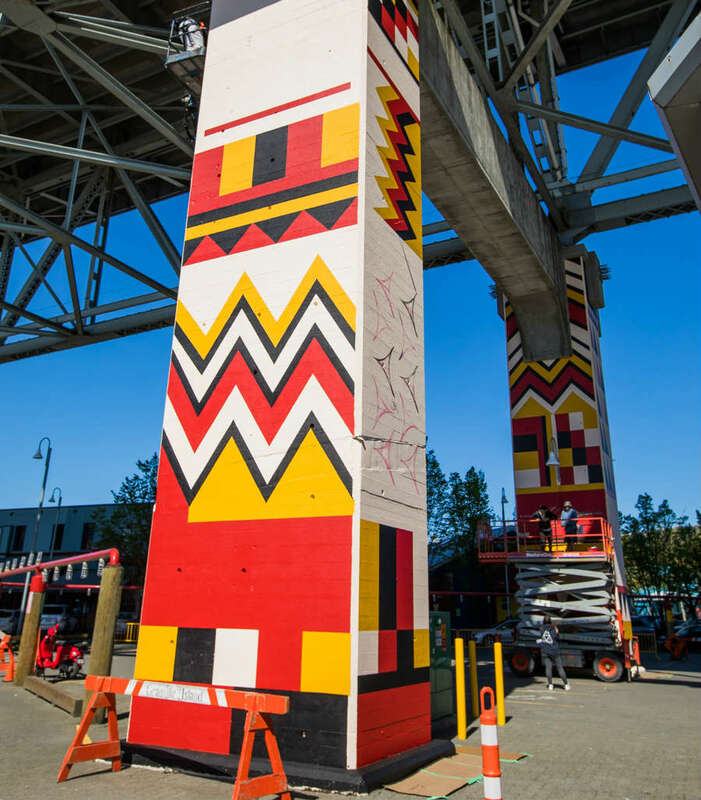 Through consultation with many community stakeholders we have identified three main opportunities: Developing ongoing multi-year partnerships through collaborative art projects to create tangible outcomes, building capacity in indigenous communities through professional skills training and artist training for youth, and creating opportunities to for Coast Salish artists to bring cultural identity back Vancouver neighbourhoods. Mural Pictured: Eagle Opens Up, by Paul Windsor. Our Kulus (Young Thunderbird) workshops are crafted for and by indigenous youth, teens and young adults. Our community partners include Lu’ma Native Youth Mentorship Program, Collingwood C.R.E.W, Raycam Community Centre and UNYA’s OCM Program. Our goal is to help add capacity to these established programs to offer experiences that build both cultural- and self- esteem. This year we are offering additional workshops including: Introduction To Formline, facilitated by our new Indigenous Youth Coordinator Ellena Neel. Each year we endeavour to partner with an established indigenous artist or artist collective to co-produce a series of work, or create a special kind of mural-related work that extends beyond what can be accomplished inside of our normal festival format. Last year, we partnered with Culture Saves Lives and The Downtown Eastside Centre for the Arts to co-produce the Healing Quilt Mural. This year, we launched Blanketing The City with Debra Sparrow (pictured above in-process). Check our blog for more info.